A lot on this trip has been planned as we go along, depending on the weather, our mood, our budget, etc… but not The Great Wall. Hiking it was a must from the early stages of our trip planning and has been something that Josh has wanted to do since he was little. Bucket list: check! 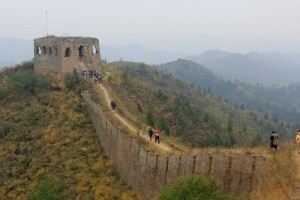 Most tourists to Beijing visit the Mutanyu or Bandaling sections of The Great Wall that are completely revamped in Chinese newness. There you can get a cable car to the top, stay inside a glass room once you get to the top if it’s too breezy for you and even toboggan down when you’re done (seriously!). 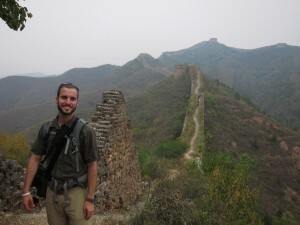 Aside from tobogganing down The Great Wall of China, which sounds ah-mazing, these modernized and sterilized sections of The Wall weren’t quite our cup of tea. 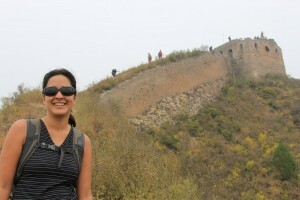 I spent time looking into camping on the Great Wall. Some people do it, but it’s not exactly legal. With all the bribing it seems that small tour companies need to do to get local officials or villagers to look the other way, makes the overnight far too expensive and a little dodgy to boot. 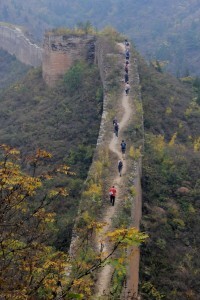 So I narrowed in on hiking and thankfully found Beijing Hikers. BH was started by expats targeting expats who wanted to get to places that they would have a difficult time getting to alone. 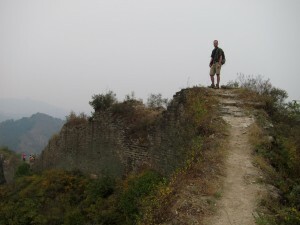 They specialize in hikes to lesser visited parts of The Great Wall and we signed up for a slightly harder than moderate hike from Gebeikou to Jinshanling. Beijingers seem to discuss air pollution like Washingtonians discuss politics. 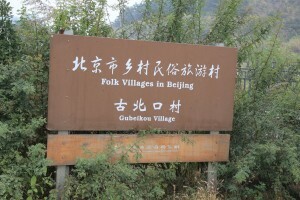 We’d seen it all over China (Chengdu was the worst) but so far had only one day of blue skies to speak of in Beijing. The day of our hike, of course, was the worst. We woke up at 7am to air pollution so thick we were unsure whether we’d be able to see The Wall when it was right in front of us, but off we headed to make our 8:30 am rendezvous with BH and started the 2+ hour drive out of the city. 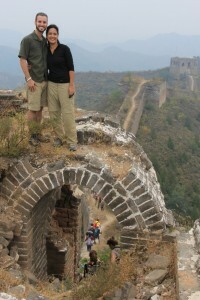 We began with a short but steep climb to reach The Wall. 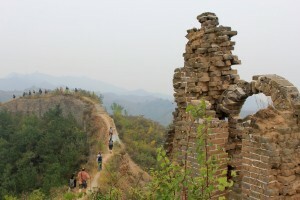 The section we hiked was largely unrestored and with tons watchtowers, some in good condition and some crumbling. It definitely felt like we were walking the perimeter of ancient border. Though we were a ways out of the city, the smog didn’t fully lift, but it abated enough and it couldn’t kill our excitement to see The Wall snaking the troughs and crests of the horizon like a Chinese dragon in a New Years festival. Like Angkor Wat, the Pyramids and the Taj Majal, this feat of human engineering and the sheer manpower needed to create is staggering. After twenty-two centuries, and a cultural revolution that saw The Wall as a symbol of feudal oppression, the fact that much of it still stands for us to walk on is amazing. We let our imagination run wild about defending from marauding invaders like Mulan in Disney’s epic. That’s real, right? Since it’s hard to be even slightly isolated anywhere in China we were amazed that during our four hour hike over ten kilometers, we saw only a handful of other people on the wall aside from our group. Two of them were women from a near-by village who hiked up to try and sell us “I Hiked The Great Wall” t-shirts. Against my normal aversion to souvenirs on this trip (tiny bag! ), I bought two. We wore them the next day when we roamed the Forbidden City. 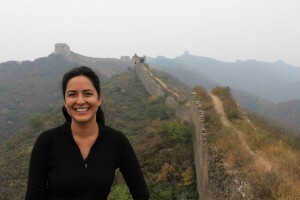 The Great Wall of China was not on my bucket list but it should have been. Love the worn path along the top, that looks fantastic.